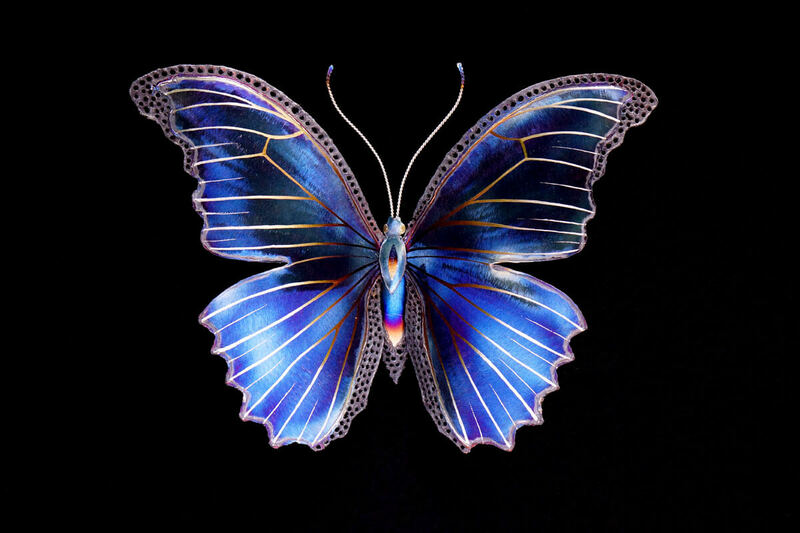 This handmade blue morpho butterfly sculpture is wall hanging and is made entirely of stainless steel. I have been lucky enough to visit Costa Rica a few times and during hikes through the jungle I have been fortunate to see endless alluring plants, animals and insects. One that completely captivated me was the blue morpho butterfly. This exquisite creature has wings that are a dazzling iridescent blue on the insides and intricate brown with a large eye shapes on the outside. I would see a wonderful brown butterfly suddenly flash bright blue as it took flight. I never grew tired of this remarkable display. As for creating this sculpture I had been wanting to make one for a while and was given the opportunity when someone contacted me through my website wanting a blue butterfly for his parents anniversary. I immediately thought of the blue morpho. I designed this one to be at a lower price point so instead of doing my usual weld detail for the veins in the wings which is far more time consuming I decided to make it a little smaller and add grind details to create the veins. I simplified the body a bit as well and I am very pleased with how it turned out. I then decided to create another version that had golds and purples to give clients more options! While the blue golden morpho does not exist in the real world (to my knowledge) it was a fun variation to create! I hope to be able to make a large more intricate blue morpho soon! 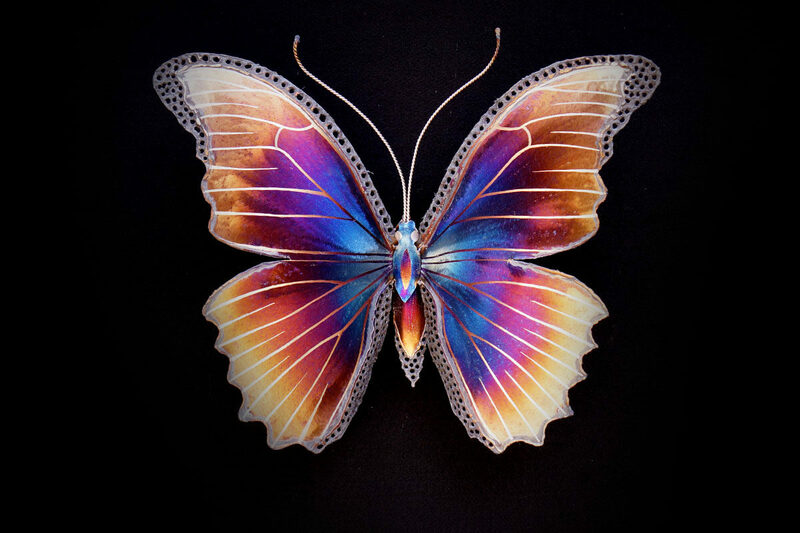 Small blue morpho butterfly sculpture. Blue Morpho with more gold for some variation! 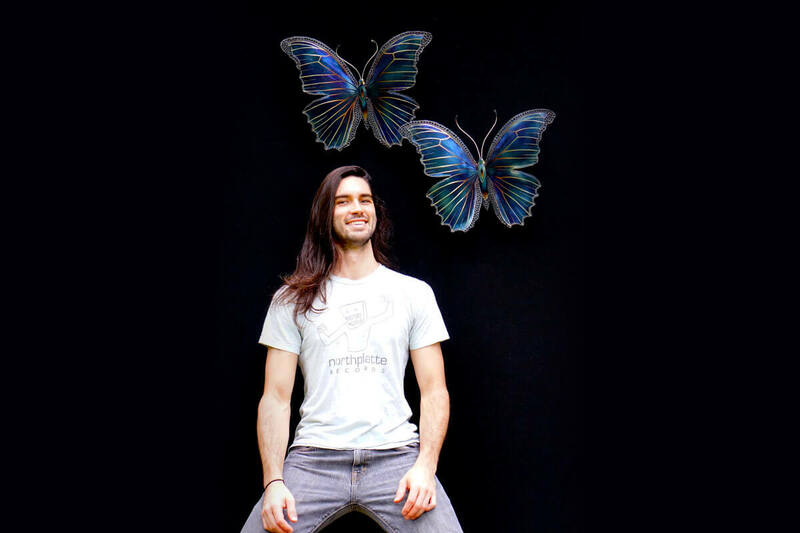 Artist Aiden Dale with two blue morpho butterfly sculptures!